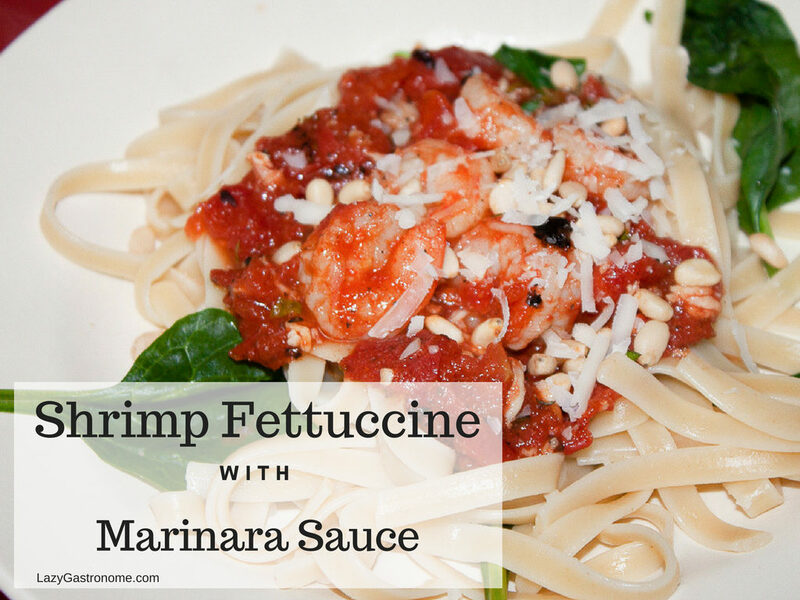 This delicious meal is quick and perfect for a week night dinner. Just add a vegetable or a salad and it’s a meal! Double the recipe and have some leftover for lunch! Heat the olive oil in a skillet on medium-high. Add the shrimp and cook for just a couple of minutes, until the shrimp just starts to turn pink. Remove the shrimp and set aside. Add the tomatoes, garlic, and salt to the pan. Simmer for about five minutes. 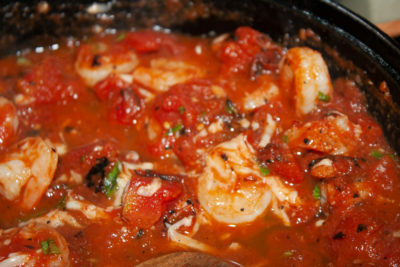 Remove about ¼ of the sauce to a small bowl. Slowly stir the cornstarch into the mixture until it is well blended. Add back to the pan and stir. This will thicken the sauce just slightly. Stir in the garlic powder, onion powder and paprika and simmer another 10-15 minutes to meld the flavors. 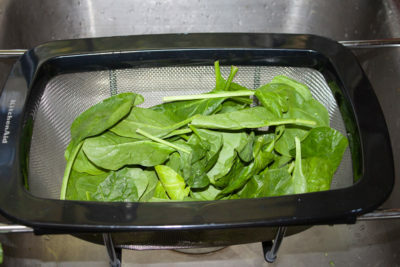 Stir in the spinach and cook until it starts to wilt. Add the shrimp back to the pan and cook for about 5 minutes. Portion the pasta out into four bowls. 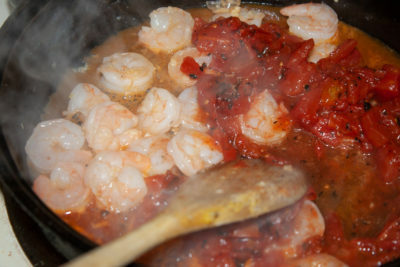 Top with ¼ of the shrimp and tomatoes. 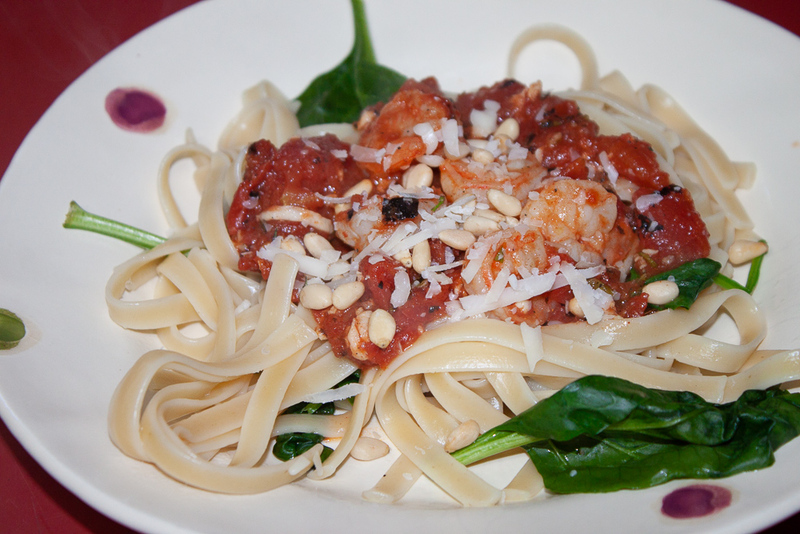 Garnish with the basil, parmesan and pine nuts. Below are some of the items we used to create this recipe!